Quite a few security researchers agree that Tube Dimmer is a program your computer could do without. It is an adware application that obviously displays an entire galore of commercial advertisements. There are actually more ways to download Tube Dimmer than to remove it. It may come from its official website or bundled with a variety of adware and freeware. Despite the fact that Tube Dimmer is not an extremely dangerous computer application, it is not recommended to keep it in your system, because it could be related to a number of potential security risks. Computer users have been complaining that Tube Dimmer come with such third party applications as Visual Bee (a browser add-on from Conduit group), SafeMonitor adware and even Websteroids potentially unwanted program. Quite a few adware removal applications do not detect Tube Dimmer, because the application is not malicious. 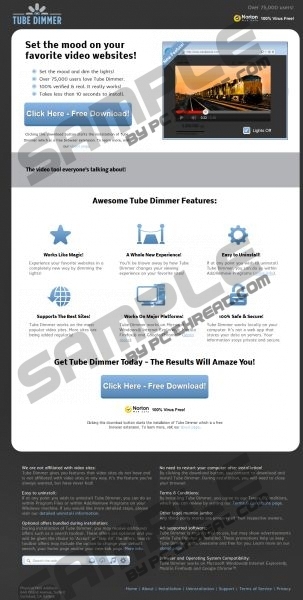 It even has its own official webpage at tubedimmerapp.com where you can find additional information on the product. On the surface it does seem as though there is nothing wrong with Tube Dimmer. According to its official website, there are over 75,000 users who trust and use Tube Dimmer supposedly to improve their online video watching experience. After all, the main function of the application is to dim the background of a website while you are watching a video online. The function is slightly confusing, however, as you can easily enter the full screen mode on basically any online video player, and there is no need to dim the background anymore. What is more, Tube Dimmer claims to work solely on your computer, and do not collect additional data on its servers online. However, it is compatible with Mozilla Firefox, Google Chrome and Internet Explorer browsers, AND it does tend to arrive bundled with freeware. Hence, it is possible to infer that the application is not as safe as it claims. We cannot ignore the possibility that Tube Dimmer could be exploited by malicious third parties to display their advertisements. Not to mention that third party ads do impede your overall web browsing process and an accidental click on a corrupted advertisement could eventually lead you to a dangerous website or worse – malware infection. In order to avoid dire consequences, you need to get rid of any potentially unwanted applications that could pose security risks and Tube Dimmer is one of them. Refer to the instructions below for manual removal and if do consider scanning the computer with SpyHunter free scanner, as this tool will help you determine whether your system is protected or not. Do acquire a licensed antimalware application if need be. Select Uninstall a program and remove Tube Dimmer. Click Uninstall a program and remove Tube Dimmer. Go to Add or remove programs and uninstall Tube Dimmer. If you have any further questions about how to ensure your system’s security, do leave us a comment in the box below. Quick & tested solution for Tube Dimmer removal.